In the hot Arizona desert of the late 1950s, Mike McGurk comes of age in one big, riotous gush. 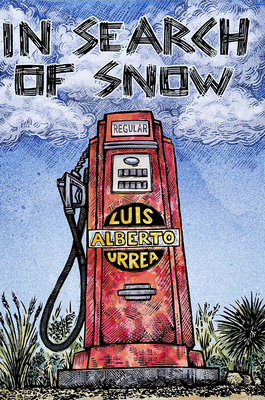 Trapped pumping gas at a desolate roadstop, he yearns for things he has never known: love, hope, and the soft, white calmness of snow. Mike's world is filled with a menagerie of quirky characters, who cope with the weight of their unfulfilled dreams with bravado, humor, and violence. Mike trades snappy insults with his macho father, Texaco Turk McGurk, a moustachioed amateur boxer and self-proclaimed war hero who is unable to talk about love. Mike lusts after Lily, his seductive, poem-writing cousin. He cowers before and then confronts the vicious Ramses, grandson of Mr. Sneezy, the wisecracking Apache. And he is rescued by his best friend, Bobo, who delivers him into the care of the loving and generous Mama and Papa Garcia. In Search of Snow is an explosive coming-of-age adventure, full of hilarious episodes and still, poignant moments. Like a blue-collar Don Quixote, Mike must blow up his windmills before he can set off to find the things he lacks, especially the snow that will temper the passion he has just set aflame.